Heights: 1/4", 3/8", 1/2", 9/16", 3/4"
Base Lengths: 2", 2-1/2", 3-1/2"
Ordered Reno ramp K what do you recommend for bonding it to the floor? Would the Reno Ramo K be suitable for a concrete garage floor edge? Would it be strong enough to drive over? 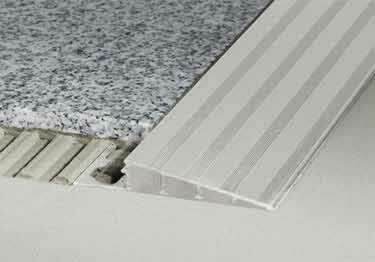 Schluter®-RENO-Ramp and RENO-Ramp-K Profiles are sloped profiles designed to protect tile edges while providing a smooth transition between tile and flooring or finished concrete at lower elevation levels. Sloped surface design creates easy access for wheel carts and helps eliminate trip hazards.